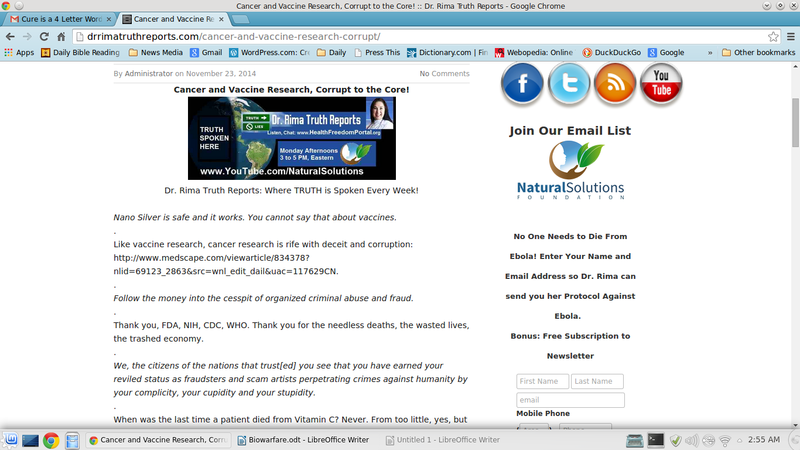 FDA/CDC/WHO- do these organizations have our best interest at heart? Have they sold us out to Vaccine Big Pharma? Have they become institutions, not held accountable, for millions of deaths around the globe, regardless of class, color, race, religion (CCRR)? Few world recognized medical doctors would challenge the FDA. In her attempt to make known an Ebola remedy, Dr. Rima has done just that! There is a common belief, the poor of this world are the least protected when it comes to vital services of health, education, housing, and employment. Ebola and ever evolving, GMO emerging viruses, of an endless list of assortments, creates a viable market amongst the rich too- those who can afford to pay out of pocket or by means of ever increasing outlandish insurance premium rates. Dr. Rima, health freedom advocate, a supplier of Silver Sol 10 PPM, shares her inside knowledge of an Ebola remedy and pleads for public support, as FDA attempts to drive Natural Solutions Foundation into bankruptcy. Previous postFDA, CDC, WHO hold the keys of death in their MSM suppression of a known remedy for past, present, and future Ebola flu like viruses! Next postTwo Reporters Fired By Fox News For Exposing Monsanto! This Is What They Have To Say.